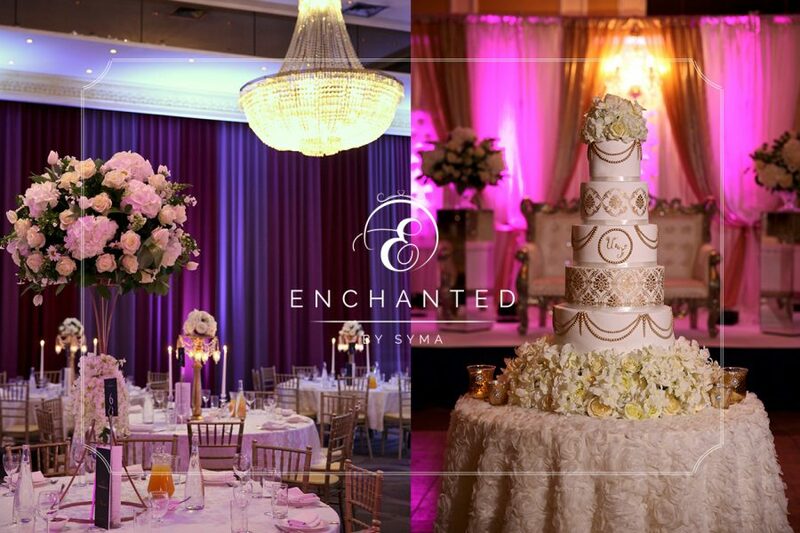 Enchanted by Syma had the pleasure of creating a beautiful floral wedding for our clients at The Thistle Hotel, Bath Road, West London, a popular wedding venue that can hold up to 500 wedding guests. The Thistle is known for their high ceilings and grand decor and Director Syma wanted to create her signature style of extravagant luxury center pieces in the classic colours of white, ivory and a touch of green. Our stunning Bride and Groom wanted the wedding decor to be stylish and classy so we designed 6 large statement centerpieces to reflect the huge chandeliers. 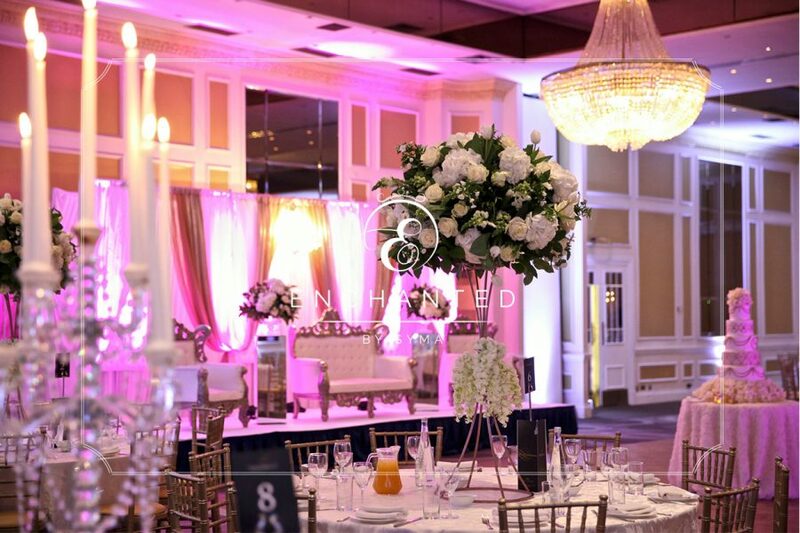 The fresh flower arrangements coordinated with the reception room decor and created an elegant setting. We wanted to do 3 styles of centrepieces which is a trend we have set being London’s leading wedding decor company, with crystal candelabras centrepieces which create a romantic atmosphere and hanging tea lights in the distance. The wedding stage was framed by a beautiful draped backdrop with our classic wedding chairs for the bride, groom and their family, making it a perfect photo setting. 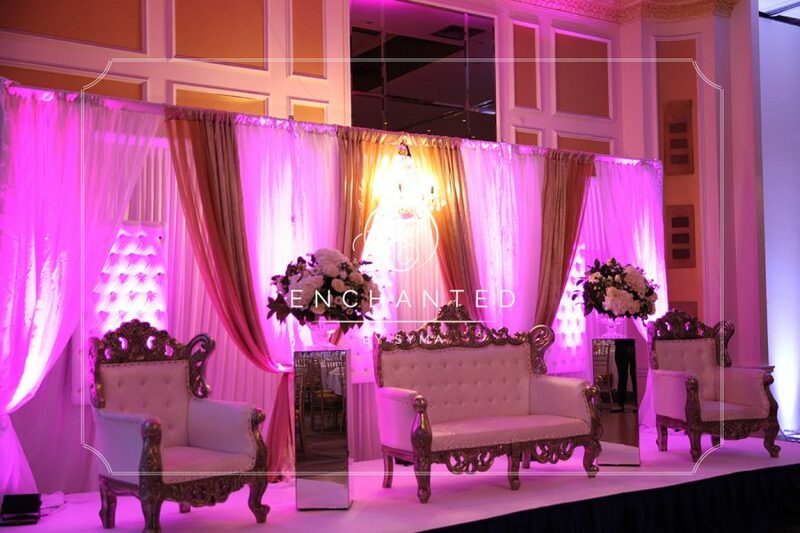 Mirrored pillars with fresh flower arrangements complemented the stage and tied it in beautifully with the table decor. Purple Gobo Projection also known as Gobo Light Projections were moving around giving the room a beautiful soft atmosphere. Being a London wedding supplier the Thistle is one of our Top London Venues to decorate. 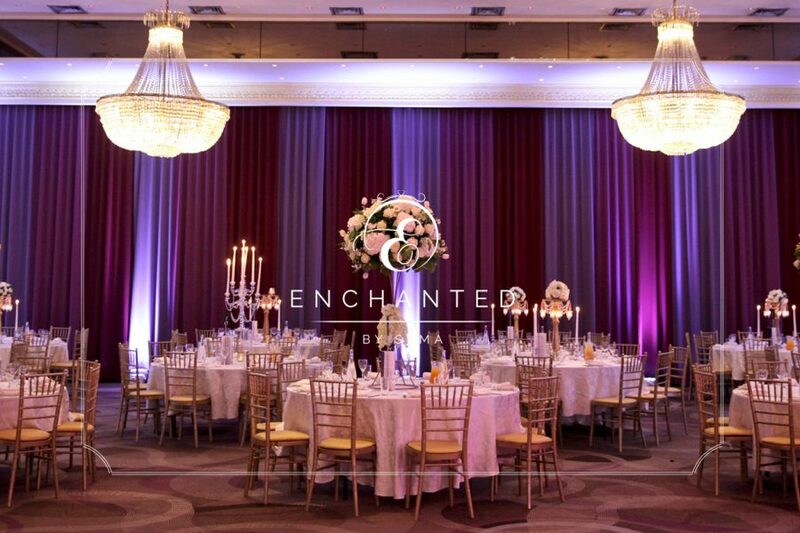 The neutral pallet gives the venue a timeless feel and we love creating the latest wedding trends for our clients. 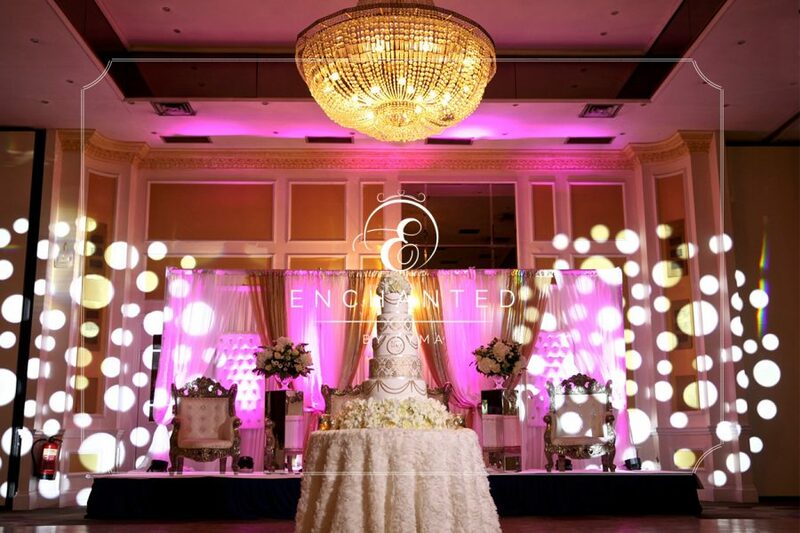 The beautiful wedding cake by Luxury wedding cake company Sweet Hollywood created an intricate ivory and gold wedding cake with damask and pearl detailing which complimented the decor beautifully. Leading Asian wedding caterers, LaFreshco provided mouthwatering cuisine and the music was a hit with the guests with Asian DJ Karizma. 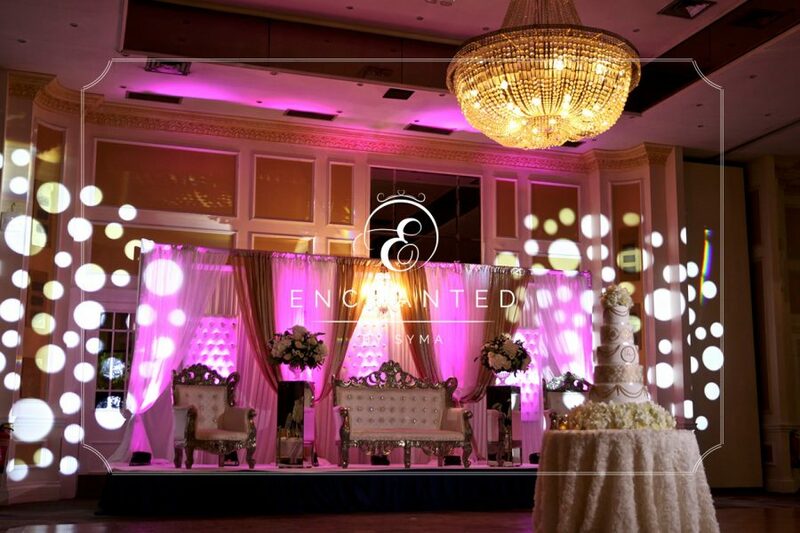 We can not wait to see Epic Media video who specialise in Asian wedding cinematography and images from Mehul Ghedia who has a new contemporary style to the Asian Wedding Photography Industry. 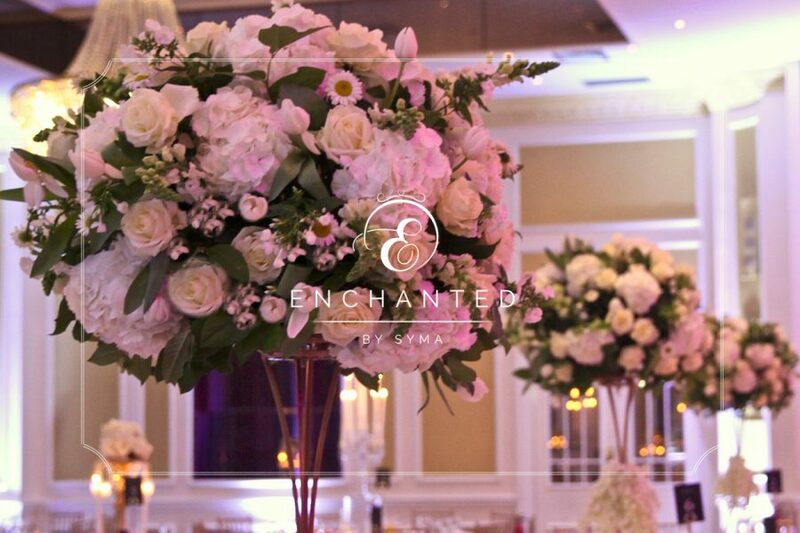 Being London’s leading wedding supplier, we specialise in large luxury wedding events and flowers. Not only do we design our own fresh flower centrepieces, we also design our own wedding stages, backdrops and ensure clients match every detail from table linen to Chiavari chairs, taking the stress away and allowing the bride and groom to enjoy themselves.